Need help with social phobia? Do you think you have a social phobia? Maybe you feel you give the impression you are unfriendly, yet its because you feel you have nothing interesting to say? Its a problem interacting with new people or taking part in group activities? Did you know there’s a way for you to feel comfortable in a group? Birmingham NLP master practitioner Debbie Williams teaches you a few strategies in the video below. You can feel like you belong there and to have the confidence to allow to speak with out fearing whats going to come out of your mouth. The video below will give you some helpful hints and NLP based tips whilst explaining a possible cause of social phobia. One of my clients a lady in her late twenties had a social phobia and came to see me because she felt that she couldn’t take part in groups chats or talk to strangers at parties as her confidence would fly out the window and what ever she said would come out wrong. This lead her to stand there feeling arwkard and wanting to exit the situation. We talked about her beliefs and how they impact in maintaining the social phobia. After a few sessions in my Birmingham NLP clinic, my client was comfortably using the strategies I talk about in the video. After a few weeks she came back for a follow up session just to make sure every thing was ok. My client was a lot happier, having attended a wedding and family birthday, 2 situations she would have hated before. Take a look at my video see if it can help you with your social phobia. Is there a cure to my food phobia and fussy eating? Yes you can re-train yourself to add more variety to a restricted diet to improve your health and well-being with Birmingham NLP and hypnosis self help recording. If you have a food phobia or have grown up on a restricted diet and want to eat more variety in your diet but keep gagging when you try new foods. Or maybe you think ” help me I can’t even try certain foods” then this Overcoming a food phobia hypnosis recording will help as it by-passes the conscious mind reducing the fear of eating helping you to lose the fussy eating tendencies as you gradually add more foods and feel comfortable eating them without gagging. Let go of your restricted diets and fear of foods and phobia about eating once and for all. Click the link to get your “overcoming a food phobia” right now. You can read more or just download it for £19 and leave your food phobia and fussy eating in the past. When Birmingham NLP hypnotherapist works with clients one to one she uses techniques on her Ultimate confidence recording, it helps you understand what stops us from being confident and how sometimes it limits us in our ability to achieve our goals. She takes you through changing negative beliefs and using NLP to help you become confident whilst introducing simple strategy for change using your physiology. She will teach you that by saying a certain phrase whilst changing your internal focus will give you ‘Ultimate Confidence’ instantly. First we must recognise what worry is. It’s the brains attempt to make sure we are prepared in advance, yet it can prevent us from sleeping as we get stuck in the ‘worry’ feeling and don’t progress or process it to find worry’s true message which may be very useful to us used in the right way. If you are a worrier, know that worrying never solved a problem. I mean, can you remember the last time a tricky situation resolved itself as a result of you worrying? The answer is most likely “No”. So why is it worriers convince themselves that if they keep worrying somehow everything will be better. Could worrying actually just be a bad habit that you just do? The reason we’re reluctant to stop worrying is because by stopping it feels as if we’re losing focus or taking our eye off the problem. You can learn how to release your stress and finally be free of your worries. My ‘Stop Worrying’ and ‘Create a Wonderful Life’ recording will go a long way to help you with the strategies you need to deal with issues, finding workable solutions as they arise teaching you to transform the worrying habit for good. 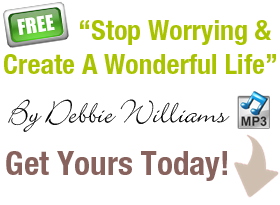 So sign up now and download my recording ‘Stop Worrying and Create a Wonderful Life’. Listen regularly to obtain the best results (ideally every day). Help me to be happy and help me find happiness and how to change life for the better by learning to be happy, you can learn to be happy or if you are thinking “help me be happy again” this free positive psychology sel help hypnosis recording Is a great place to start. Please subscribe to my channel as there are lots of “happy movie s” for you to watch with strategies of happiness. With Quotes about happiness from Paul McKenna and others to how to have a happy life. “help me to be happy” and “”help me find happiness” is a question Birmingham hypnotherapist Debbie Williams has been asked many times. Being happy is a state of mind and Debbie is happy to help you learn to be happy with her many free hypnosis self help recordings and self help videos. Being happy can be taught as a process of “mind over matter” and authentic happiness and having a happy life is your birth right. Get your free recording and you will also be the first to get any free ebooks “how to be happy book” and other useful info. Being happy and Learn to be happy. Paul McKenna quotes about happiness saying the trouble with happiness is people don’t practice it, with hypnosis and NLP strategies you can learn to train your mind to focus more on the positive. You can learn to be happy, being happy is a state of mind. Subscribe to my you tube channel where there are links to lots of free downloads and videos on how to find happiness and how to change life for the better. The link above takes you to my “ultimate confidence” hypnosis recording which yo can read more about. It has 5 tracks and the trance plants suggestions of being happy and living life in the miracle zone of attracting not only a happy life but wealth, health and authentic happiness. It cost only £19 as a download. You can get lots of free hypnosis recordings from links on my videos if you are not ready to buy right now. Please subscribe to my channel and suggest videos I can record to help you to know how to change your life and how to find happiness. Being happy is your birthright and so is having a happy life. Happiness?and how to be happy. Could this be the answer to any emotional/ mental problem ? Could it be studying how to be happy and focusing on having balance in our life ( even as an obsessional goal) give us that elusive peace of mind. Can happiness be learned and cultivated? How would you know if you had it? and how can you start to recognise when you are happy? Do you seem to sabotage any happiness and want to know how to stop? Who are you really and why are you here? How can you make sense of it all? Could the answer be that at this point in history you are discovering your brain has an agenda all of its own and one you don’t much care for most of the time. Our lives in modern times, whilst being stressful also gives us time to think. We need to have a better perspective of this ol’ brain and take the reins for a change. If someone offered you the gift of the owners manual, would you use it? Sports people have the secret, wonder what it is? How to be happy is it just a habit you can master? Well we have the owners manual here for you right now and how to build the happiness habit. 1, How can I be happier right now? 2 What 3 things have made me smile or laugh today? 3 What are the possible areas of my live that feed into happy/rewarding feelings? 4 Have an attitude of gratitude; What am I grateful for right now? 5 I wonder what miracles I’m going to witness/or be a part of today? The secret that sports people is focus, that’s it focus on what you want. What you practice and focus on you will get more of,lets get building the happiness habit. Recognise you are in the top 10% richest human beings on this planet. You are already the chosen one. You could of been born into abject poverty, but your not. With NLP and hypnotherapy we can teach you how to step into the shoes of genuinely happy people to gain insight (in sight) from the inside to shed your layer of pain, worry and faulty thinking and to accelerate your progress to become happier and happier. Its time to stop a bad habit and start a good one. By filling in the form above you agree to receive emails from me. You can unsubscribe at any time. I will never share your details with any third parties. I hate spam as much as you do. © Copyright Debbie Williams Associates.